Dr. Manouchehr Moshtagh Khorasani is the award-winning author who won the prestigious awards of the Book Prize of the Islamic Republic of Iran in 2012 for his book Lexicon of Arms and Armor from Iran: A Study of Symbols and Terminology and the Book Prize of the Islamic Republic of Iran in 2009 for his book Arms and Armor from Iran: The Bronze Age to the End of the Qajar Period . Notwithstanding the staggering development and variety of the mass media, books are still the most authentic and commendable means of transfering and promoting the culture and the most conspicuous symbol of cultural dynasim. The loftly status of the pen and the sublime rank of writing are continuously respected by the authorities throughout the world. As a system adhering to Islamic instructions with rich Iranian and Iranian culture, the Islamic Republic of Iran considers itself committed to uphold preserve the sacred realm of the pen and support and extol the men of learning. 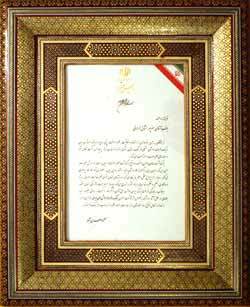 In order to perform this serious duty, the Ministry of Culture and Islamic Republic of Iran" in 1983, and "The World Prize for the Islamic Republic of Iran" in 1993, with the aim of selecting and introducing international books, and honoring their creators as thy have elevated the general knowledge and culture, and have developd public familiarity with written heritage. Every year, according to this plan books published within the year before in countries other than Iran in various languages are reviewed and the President's special Plaque of Commemoration and valuable prizes will be awarded to the authors. In this round, after the first selection of about 2500 titles in different fields of Iranian and Islamic studies, 328 titles entered final stages, and were thus evaluated. Among all these, 202 titles were in the field of Islamic studies and 126 titles in the field of Iranian studies. The evaluated books in the field of Islamic studies include: Behavior and Life of the Prophet, Islamic Economics, Scholastic Theology, Theology and Ethics, Translation of Qur'an, Jurisprudism and Islamic Law, Qur'anic Sciences, Qur'anic Studis and Interpretation, Philosophy and Gnosticism, Contemporary Islam, History of Islamic Civilization, Knowldge of Shiite Sources, Political Sciences in the World of Islam, Womens' Rights, the History of Science, Art and Islamic Architecture. The evaluated books in the field of Iranian studies include: Ancient Iran, Military Scinces, Ancint Iran Civilization, Handicrafts, Art and Iranian Architecture, Literary Criticism, Persian Language and Literature, Persian Lierature and Poetry, Iranian Sociology, Manuscripts Studies, Contemporary History, the History and Thoughts of the Islamic Revolution and Islamic Gnosticism. The evaluated books are in English, French, Grman, Italian, Spanish, Hungarian, Arabic, Georgian, Chinese, Urdu, Japanese, Russian, Serbian, Istanbuli and Azari Turkish, Bulgarian, Albanian and Bosnian. Arms and Armor from Iran: The Bronze Age to the End of the Qajar Period by Dr. Manouchehr Moshtagh Khorasani wins the World Prize for the Book of the Year of the Islamic Republic of Iran in Iranian Studies. The Ministry of Culture and Islamic Guidance founded “The Book of the Year of the Islamic Republic of Iran“ in 1983 and “The World Prize for the Book of the Year of the Islamic Republic of Iran” in 1993, with the aim of selecting and introducing international books, and honoring their creators as they have elevated the general knowledge and culture, and have profoundly developed public familiarity with the written heritage. Every year, according to this plan, books published within the year before in countries other than Iran in various languages are reviewed and the President’s special plaque of Commemoration and valuable prizes are awarded to the authors. In this round, after the first selection of about 2000 book titles in different fields of Iranian and Islamic studies, 252 titles (78 titles in the field of Iranian Studies and 174 titles in the field of Islamic Studies) were selected for the next round (final stages) and were further evaulated by a panel of scholars from different universities in Iran and abroad. The evaluation of works in two fields was conducted on the basis of preliminary appraisal of the works on the basis of published lists of books, discussions with academics, research and publication centers as well as information dissemination centers, participation in the most reputable international book exhibitions and counseling with instructors and distinguished experts in the fields of the Iranian Studies and Islamic studies both in Iran and abroad. Arms and Armor from Iran: The Bronze Age to the End of the Qajar Period by Dr. Manouchehr Moshtagh Khorasani (Independent Researcher). Bactrian Documents (2 vs.) by Dr. Nicholas Sims-Williams (SOAS). The Origin of the Indo-Iranians by Dr. Elena E. Kuz`mina (Moscow State University). Science and Poetry in Medieval Persia: The Botany of Nizami`s Khamsa by Dr. Christine van Ruymbeke (University of Cambridge). Forgotton Empire: The World of Ancient Persia by Dr. John Curtis and Dr. Nigel Tallis (The British Museum). Iranología: Historia, Religion, Literatura by Dr. Juan Martos Quesada (Universidad Compultense de Madrid) and Seyed Ahmad Khezri (Iranian cultural attaché in Madrid). Persian Wisdom in Arabic Garb: Ali B. Ubayda al-Rayhani and his Jawahir al-Kilam wa-Faraid al Hikam (2. vs.) by Dr. Mohsen Zakeri (Universität Frankfurt). Iráni Föld-Perzsa Kultúra: Dr. István Nyitral (Budapest University). The Collected Lyrics of Hafiz Shiraz by Dr. Peter Avery (University of Cambridge). Rome and Persia in Late Antiquity by Dr. Beate Dignas (Sommerville College) and Dr. Engelbert Winter (Westfälische Wilhems-Universität Münster). Modern Persian Literature in Afghanistan: Anomalous Visions of History and Form by Dr. Walli Ahmadi (University of California, Berkeley). Falnameh: Livre Royal des Sorts by Armen Tokatlian (Independent Researcher). Tapis’d Iran: Tissage and Techniques d’Aujourd’hui by Jean et Danielle Burkel (Independent Researcher). Fomun-e Al-She`r Farsi by Dr. Asad Abdolhadi Ghandil (University of Cairo). Islamic Imperial Law by by Dr. Benjamin Jokisch (Albert-Ludwig-Universität Freiburg). The Path to Virtue: the Ethical Philosophy of al-Raghib al-Isfahani by Dr. Yasien Mohamed (University of the Western Cape). Islam and Science: The Intellectual Career of Nizam al Din al-Nishaburi by Dr. Robert G. Morrison (Bowdoin College). Scripturalist Islam: The History and Doctrines of Akhbari Shi’i School by Dr. Robert Gleave (University of Exeter). Der Koran: Übersetzt und Kommentiert by Dr. Adel Theodor Khoury (Katholisch-Theologischen Fakultät der Westfälischen Wilhelms-Universität). Al-Nogush al-Ketabiye al-Fatemiyeh Ali al-Maer Fi Mesr by Dr. Faraj Hussein Faraj al-Husseini (Alexandria University).